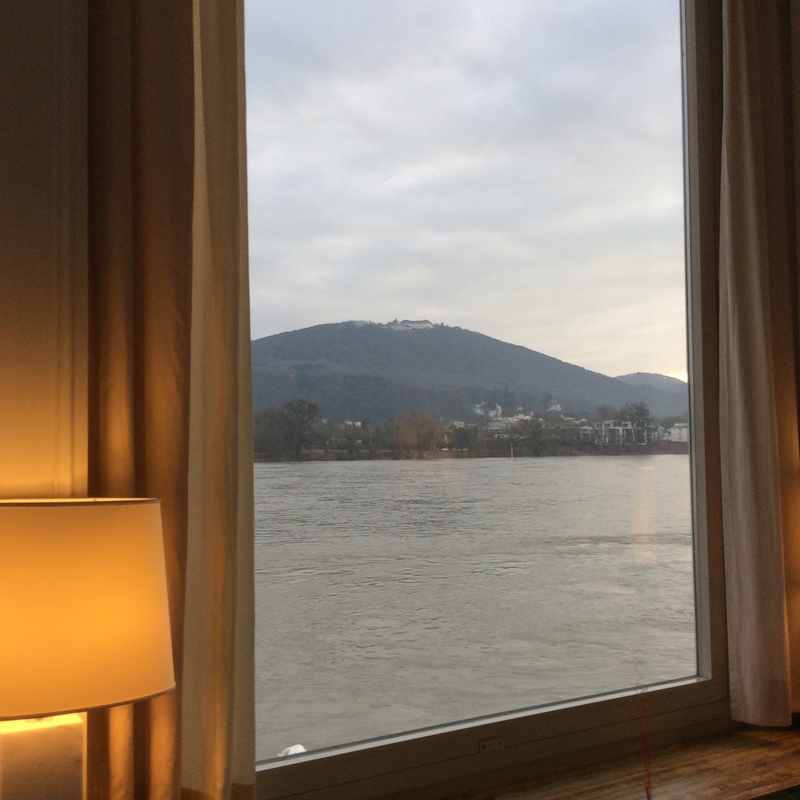 From the panoramic windows of the Rheinhotel Dreesen at Bad Godesberg, the immediate view is across the steady flow of the Rhine, towards Konigswinter. Rising just behind the town is the Petersberg, a hill formed by the remnants of a volcano, the first of the hills in the legendary Siebengebirgen uplands. These “seven hills” (an ancient magic number, though actually there are more like 40 hills) have brought many visitors to the area and to the elegant comfort of the Hotel Dreesen. Among them were celebrities such as Marlene Dietrich, Greta Garbo and Charlie Chaplin. The middle-Rhine location also attracted devoted followers of the many works of Wagner, foremost among them Adolf Hitler. In March 1945, it became the headquarters of Dwight Eisenhower during the Allied advance into Nazi Germany. Downstream, to the north, the river eventually becomes the Rhine delta of the Netherlands and brings wartime memories of the ill-fated attempt by allied paratroopers, dropped to capture and secure the bridges at Nijmegen and Arnhem. If successful, “Operation Market Garden” (September 17-26) would have meant the end of the war in Europe by Christmas of 1944. Upstream, a short drive from Bad Godesberg is Remagen where the Ludendorffbrucke became the only bridge to be captured intact on March 7th 1945, by the U.S. 9th Armored Division. To Eisenhower this bridge was “worth its weight in gold”, it then endured ten days of heavy military use and constant air attacks before collapsing. A frantic Goering in Berlin, having now diverted vital reserves to destroy the bridge, shouted that its capture was amongst the greatest German disasters of the war. A furious Hitler, in turn, ordered the officers responsible for defending the bridge shot for what he termed sabotage, as all bridges were to be blown up in the German retreat. As in history since the Romans, the Rhine was to be the “final barrier” to any enemy advance. These landmark battles were portrayed in the Holywood action films “The Bridge at Remagen”(1969), and Arnhem in “A Bridge Too Far” (1977). For Hitler, who first stayed at the hotel Dreesen in 1926 (but returned more than 70 times! ), it was the Wagnerian location that was particularly significant. The nearby Drachenfels (Dragon’s Rock) was where the hero of German Epic poems, Siegfried, the man who knew no fear, came on his initial journey up the Rhine (from his birthplace at Xanten) to fight and kill the dragon who lived in a cave on the hill. He then bathed in its blood to become( almost) invulnerable. Still today, the vineyards above Konigswinter reflect this story in the name of the wine produced as Drachensblut, Rotwein von Drachenfels in Petersberg ( Siebengebirge). Though Hitler himself was a vegetarian teetotaler, so unlikely to drink even “Dragons Blood Wine”, he was deeply steeped in Wagnerian lore and once stood by Wagner’s grave dedicating himself as the reincarnated Siegfried. The views from the Dreesen were thus of significance to him and soon a permanent Fuhrersuite, number 106, was established. It included several rooms as well as a bulletproof window overlooking the steady flow of the river. With the threat of war looming once more in 1938, vital events were to take place at Bad Godesberg. Neville Chamberlain decided to face the dictator. Though Prime Minister, he was relatively inexperienced in diplomacy but he overruled his ministers, anxious to “save Europe from war”, 1914-1918 having been such a disaster. With this in mind, he made his first ever flight on September 15th to meet Hitler at Berchtesgaden, only to hear demands for Nazi control of the Czech (mostly German speaking) Sudetenland. Returning briefly to London to confer with the French, as well as seeking approval from his own government, Chamberlain flew out again, this time to Cologne, continuing by road to the Bad Godesberg/Konigswinter area. There he was given luxurious accommodation at the Petersberg Hotel, already a famous spa, with a spectacular location at the summit of the hill. He was the first ever foreign dignitary to stay there, many more were to follow. Since 1956, the Siebengebirge area has become a nature preserve and national park and while the government has moved to Berlin, state visitors are still accommodated at the Grand Hotel Petersberg. It is frequently referred to as the “German C amp David”, while the Dreesen hotel has hosted every Chancellor of the German Federal Republic. In this area of great beauty, ancient lore and meaning, the two fabled hotels stand witness, and a reminder of events that once shook the world. Lonely Giraffe is a commentary on stories encountered on our travels that enrich the meaning of place . They are notes from a life in travel by Andrzej as Tour Manager for several luxury round-the-world operators, senior Tour Director for a major European touring company and extensive individual exploration and research. Andrzej is an elected member of The Explorer's Club and a Life Fellow of the Royal Geographical Society.